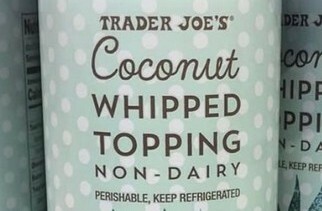 Trader Joe's Coconut Whipped Cream Awesome and Then Recalled! 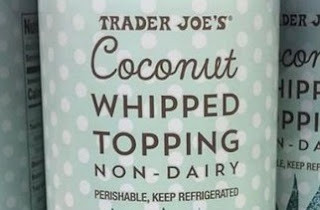 So Trader Joe's came out with a Coconut Whipped Topping, Non-Dairy product that folks are all agog about. We even bought two cans of it in the excitement. But then we tried using them. They only cost about $3 a piece! Turned out that even though we bought two of them from the Morgan Hill, CA Trader Joe's store, they both had serious issues ejecting the product. It was more like an ooze or drip than a whipped cream dispensing. What little we got out, one of us seemed to enjoy. But we decided to bring back our two defective cans, but only to find out that the product has been recalled due to "Country of Origin." And it must have been recalled quite recently, considering some store staff went looking for it and got confused because they thought they just saw it yesterday. It was recalled because of "Country of Origin." They did not expound beyond that, and I wanted my money back so I didn't pursue the issue. So for the time being, until they can get their Coconut Whipped Cream from the right country, then get the product to actually push out, not ooze out the product, you'll have to wait just a wee bit longer. Trader Joe's issued an official recall for three of its packaged poultry salads because they "may contain pieces of glass or hard plastic." Trader Joe's urges consumers to discard it or return it for a full refund.